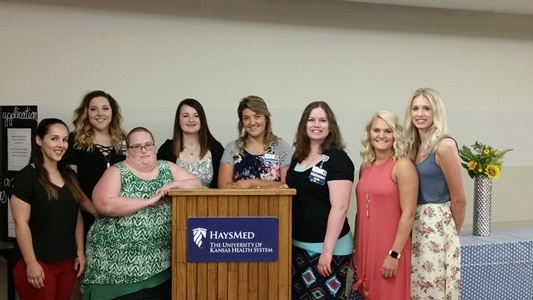 HAYS, Kansas (June 14, 2017)— Eight registered nurses at HaysMed were honored recently at a recognition ceremony and luncheon. They completed the yearlong RN Residency Program offered at HaysMed. The program began a year ago in July 2016 and the nurses spent the first 3 weeks in a classroom setting. The remainder of training focuses on clinical experience, one on one mentorship with their preceptor, high-fidelity simulations and on the job training. Additionally, nurses receive training from professionals in several departments, such as radiology, pharmacy, cardiac care, OB and others. The RN Residency class included Bailee Bittel, RN, Jaryn Brown, RN, Emily Disney, RN, Lauren Finger, RN, Lydia Hynek, RN, Kristen Lorenc, RN, Kylie Stoppel, RN and Silver VanWey, RN. Currently there are 7 nurses scheduled in the next program which begins in July. There are also 9 nurses from Colby, Smith Center and Beloit in the Rural Residency program. The program is open to newly graduated RNs.